His Birth Name is Timothy Shawn Yancey. Like many others in the field of paranormal research today, Tim Yancey has experienced something that and effected him for the rest of his natural adult life. It was a very young age, that Tim and his brother had paranomal or strange encounters with an entity in the woods close to their home. Tim Yancey is a well known paranormal researcher and host of "Encounters Paranormal Radio Series". The show airs every Sunday night starting at 9pm (Eastern) and is heard on WBZT in south Florida! Also streamed over the internet at www.encounterslive.com. Yancey was born 29 September 1961. Birthpplace West Palm Beach, Florida, USA. His Birth Name is Timothy Shawn Yancey. He is Happily Married to the lovely exciting Trish Yancey. His great sense of humor is very contagious! Search for more about Tim Yancey here Now! Throughout her youth, Trish was regularly visited by what her young mind believed was her Guardian Angel. Encounters with this being were quite comforting and beautiful, though never discussed within her family. Always a fun mystery as well, her father would quite frequently tell everyone who was on the phone and who they were calling for .... before the phone rang. Strangely enough (in retrospect), this too was simply accepted within the family, but never delved into. These things gave Trish the strongly held belief that paranormal occurrences were probably very common for others, and that they were both enjoyable and helpful. Sheltered from 'dark' images and films, it wasn't until later years that she discovered that some paranormal events can leave many individuals haunted, terrified and emotionally scarred for life. Much of Trish's adult life has been spent educating others. She began with a part time job teaching students to play musical instruments twenty-five years ago, and for the last seventeen, she has been in business for herself bringing outreach educational programs to schools, hospitals and recreation centers. Through her company, Fun Learning Adventures, Inc., Trish educates and entertains more than sixteen thousand students each year. In her second job as the Director of Youth and Family Ministry at Unity of the Palm Beaches, she develops and implements programming that teaches the next generation about the Unity movement. More than simply a job, Trish finds that educating people is where her life repeatedly takes her. Search for more on Trish Yancey Here Now! Jason Gowin began his actual trek into the unknown back in the fall of 1998 with the infamous paranormal investigation group Ghost Hunters, Incorporated, where he spent the better part of 10 years causing chaos wherever and whenever they could. Upon meeting George Lutz, the man who was the basis for the Amityville Horror book and movies, took him under his wing and was shown a new path; Jason changed his mind about certain things in the paranormal and sought out a new way in which to search for it while still keeping the same sense of humor about the subject matter that he always had. 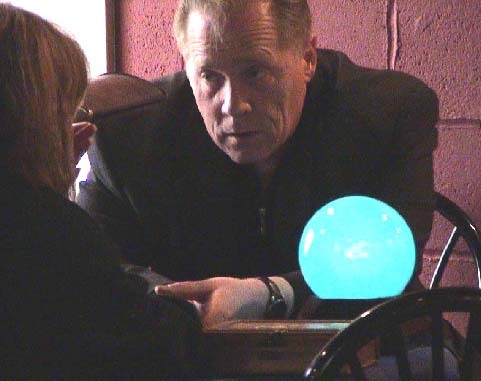 His investigations have been published in the Encyclopedia of Haunted Places by Jeff Bellanger. He has also been the basis for several widely released documentaries including New Gil Pictures “The Graveyard Shift” as well as many others. In 2008, Jason was asked by longtime friend and mentor in the paranormal Tim Yancey to become a co-host of the Encounters Paranormal Radio Program. Search For More On Jason Gowin Her Now!